Irina Khromacheva, beating the world today 312 racket JUGIC-SALKIC, Mervana (BIH) 6-4 6-2, came out in the second round of 25,000 in Tessenderlo (Belgium). Tomorrow Irina plays against ZAHLAVOVA, Sandra, 235 rackets in the world. Russian Irina Khromacheva (WC) kicks off the match with Chinese Zhang Shuai (WC), Evgeniya Rodina — Hungarian Timea Babos. 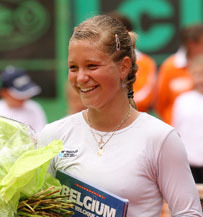 Welcome to the official site of Irina Khromacheva, recognized best ITF junior of 2011. Having started to go in for tennis at the age of 4 years old on the courts of Moscow Spartak, Irina is the winner of the two pair junior Grand Slam tournaments, accordingly the finalist and semi-finalist of the junior Wimbledon and Roland Garros. At present, Irina is training in Belgium under the guidance of Wim Fissette. All site materials are protected by the law on the author's and adjacent rights. Any full or partial copying of materials from this site without the written permission prohibited.